G. is just about to finish his second year in a Montessori classroom. 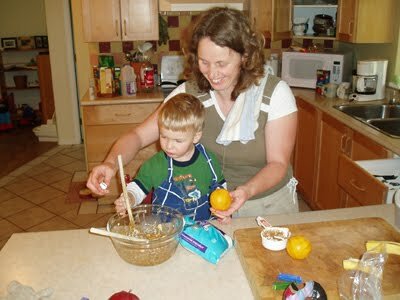 He has recently turned 5 and his mother is astonished at the changes she sees in him. 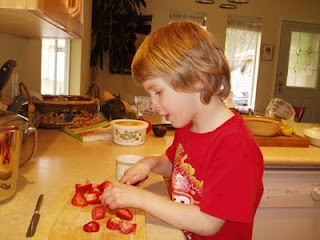 G. makes his own lunches and often helps make dinner. Since G. is older, his bed is higher. Notice the bedding. It is all child-friendly. Instead of blankets that need to be tucked in (and are challenging even to me, let alone a 5 year old) his parents have given him a small duvet. This enables him to make his bed with ease, every morning . Now that his body is bigger, so is his furniture. 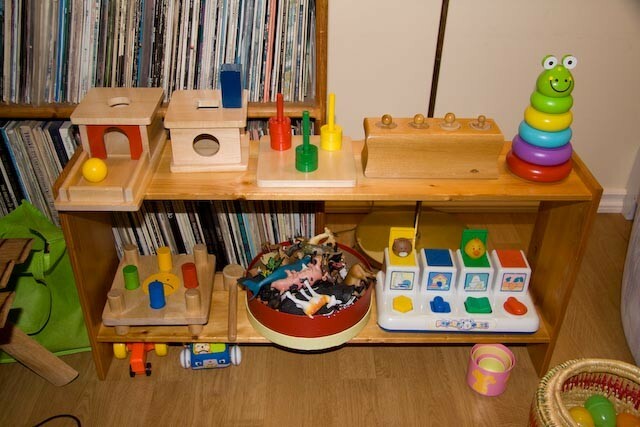 Toys and activities are still kept to a minimun and are still on shelves to facilitate his putting things away after use. His clothes are still kept where he can access them easily and a few choices have been laid out for him. Two or three choices give him the independence he yearns for and allows him to get ready in the morning with no interference from an adult. 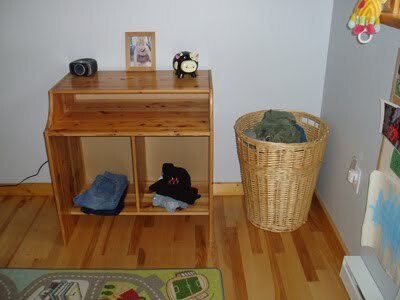 Also, he has been given a laundry hamper of his own so there is a place for dirty clothes (other than the floor ). 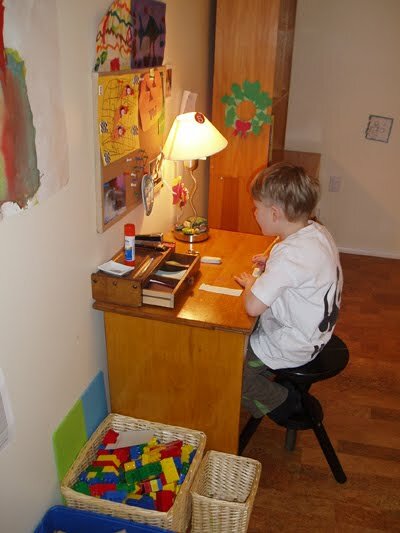 Now that he is older, he will happily work at his own desk in his bedroom. When he was younger, he prefered to be closer to his parents. This happens with many children. 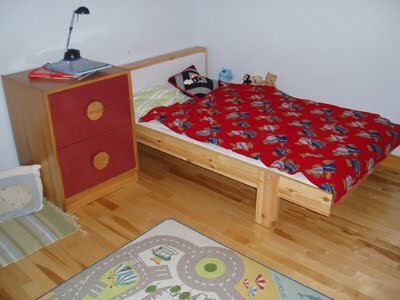 Some parents have compensated for this by having a child's table or desk in the kitchen or living room. Even on the desktop clutter is kept to a minumum. 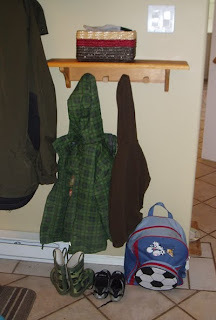 G.'s mother has embraced the Montessori tendency to use natural materials as much as possible (wouldn't it be cool if Lego was made out of wood?). Just like in the classroom, G.'s shelves are not cluttered so he can see everything and choose what he wants. Many parents rotate children's toys rather than give them too many. 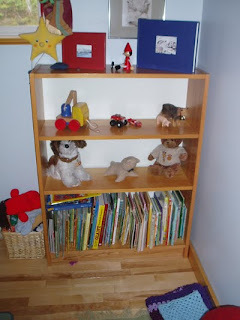 When a child seems to be getting bored with something, the child and parent can decide if it is time to change the things on the shelf. In the family room, there are two G. sized chairs - one for him and one for a friend. I also appreciate that the windows are all quite low. G. can see outside without having to stand on a stool. At the door, a small shelf with hooks has been placed at G.'s height so that he can take care of his outer wear without help. The basket on top is for his mits and hats - again, just a few choices. Since he was very small, G. has been included in every aspect of family life. This is so lovely to see. Lucky G to have a family that accomodate his needs so well. I wish my house was that tidy! Thanks. I wish my house was that tidy, too. Like many Montessori teachers, mine is full of little piles of things that I think might be useful in the classroom some day. And whatever I do to make our house a tidy, ordered environment, my husband just doesn't quite get it! He grew up with a nanny, an au pair and a cleaner so he definitely missed out on any sensitive periods of order. He has no order at all and cannot see mess - he sees comforting piles of his stuff that no-one has tidied away! We need 2 houses - 1 for him and 1 for me and the children. It would be selfish except that he does try but he truly has no concept of order! 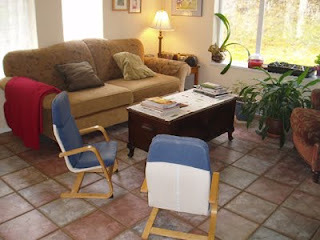 I am enjoying your blog, thanks for sharing their home environments and doing it for each of the age ranges. I have a 6 year old, 2 year old and infant, so this was really great. Nova Naturals makes something very much like wooden Legos. How wonderful that parents are sharing how they apply Montessori principles in their homes! G's house is a great example of Montessori in action at home! 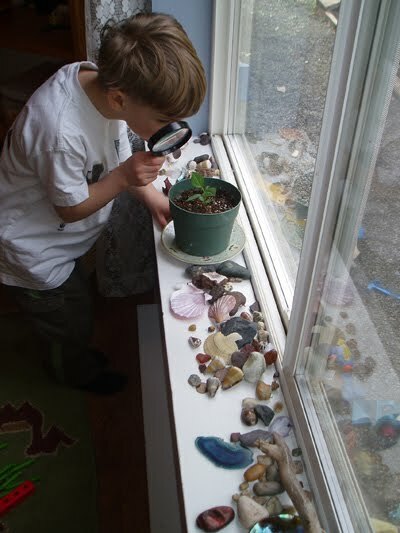 I used the windowsill photo and three other photos from your blog (with credit to you and The Montessori Child at Home) in my post http://livingmontessorinow.com/2011/03/08/top-10-montessori-principles-for-natural-learning/. Thanks for all you share! 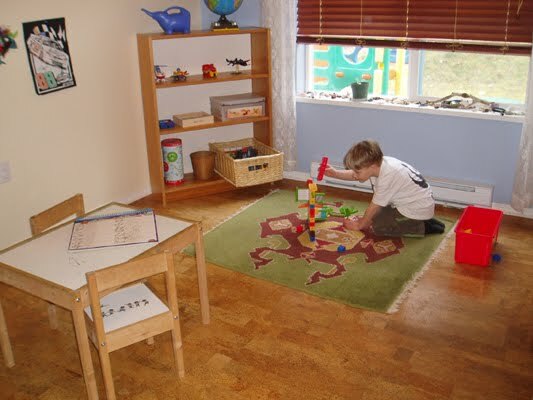 I am a Montessorian and I find your site an inspiration. So happy to see the genius of Maria Montessori live on!